The last week and a half I have been busy with my next “out of the attic” project. Today I finished up the blocks and now I am prepared to show you what I have been working so hard at. Remember the Y2K computer bug? I remember it well. The reason I remember it is because, even back then, I was heavily involved in computers and quilting cyber groups. At the turn of the century, I just love saying that, I was involved in a signature square block swap called the Millennium or Y2K swap. 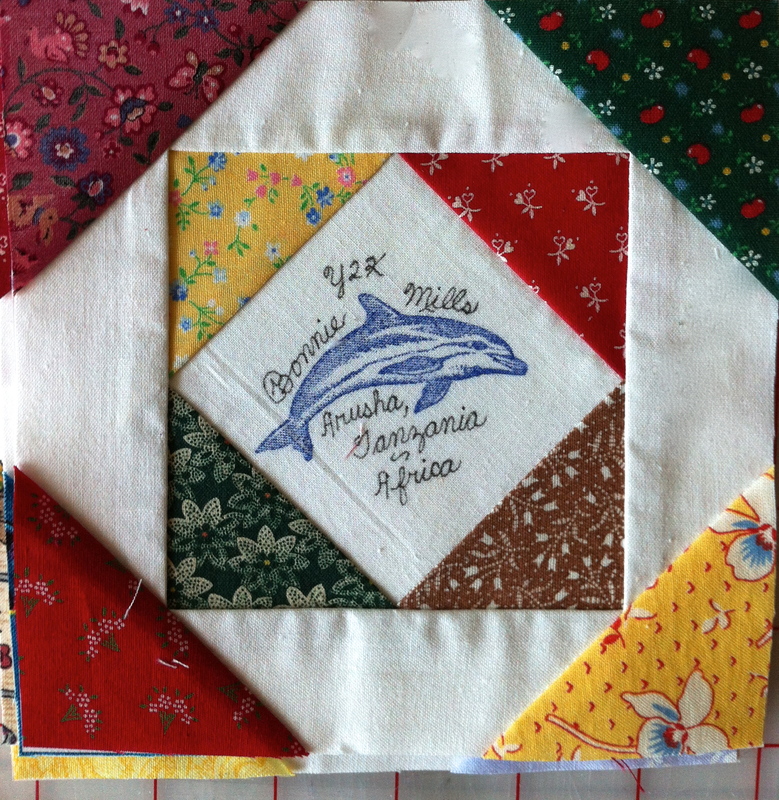 The idea was to swap a 3″ signature square and about 20+ cotton fabric squares, enough to make a patchwork block, with quilters around the world. I swapped 145 different signatures with quilters from all around the world. I am missing 5 US states, but I do have treasures like blocks from Kazakhstan, Africa, England, and Italy. 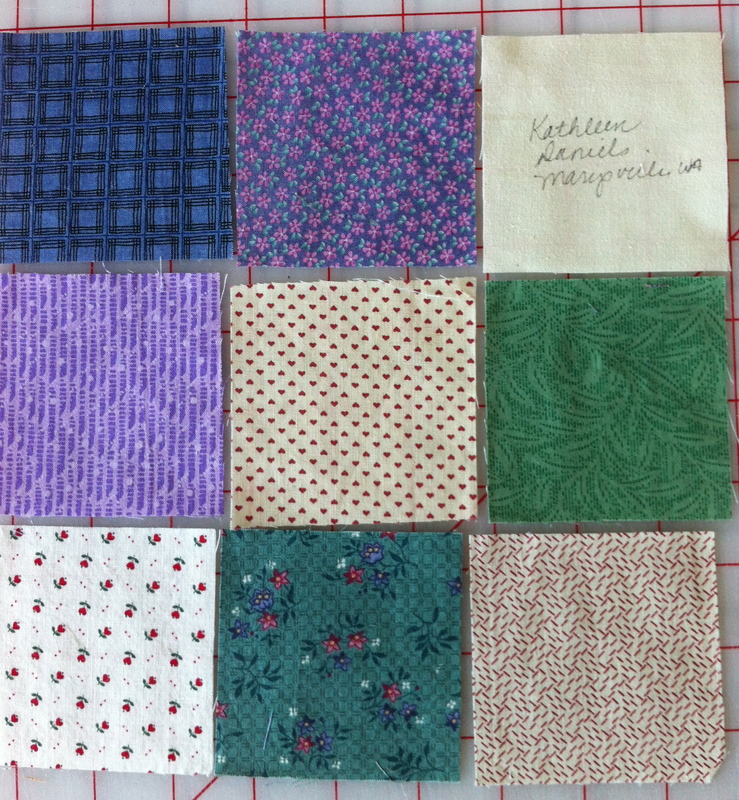 Here is a breakdown of the blocks I received and which places seem to have more cyber quilters involved in the swap at the time than others, if you are interested. After 2000 came and went, 911 hit and the squares I had received were packed away and, you got it, put in the attic for some day. It is so hard to believe that 1999 was 13 years ago. Yikes!!! 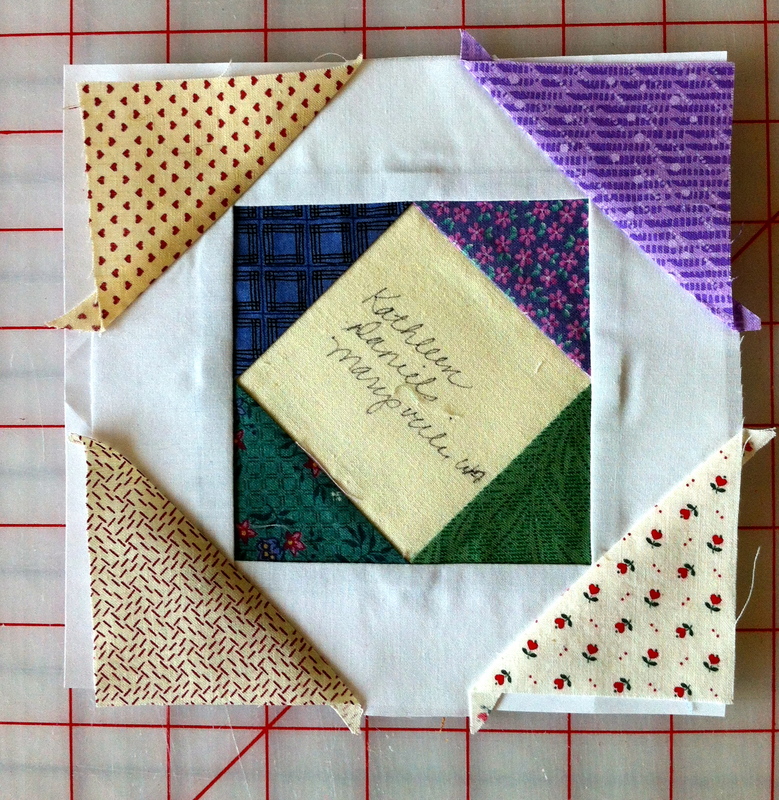 The time has finally come to make this swap into a memory quilt that we can use and enjoy. 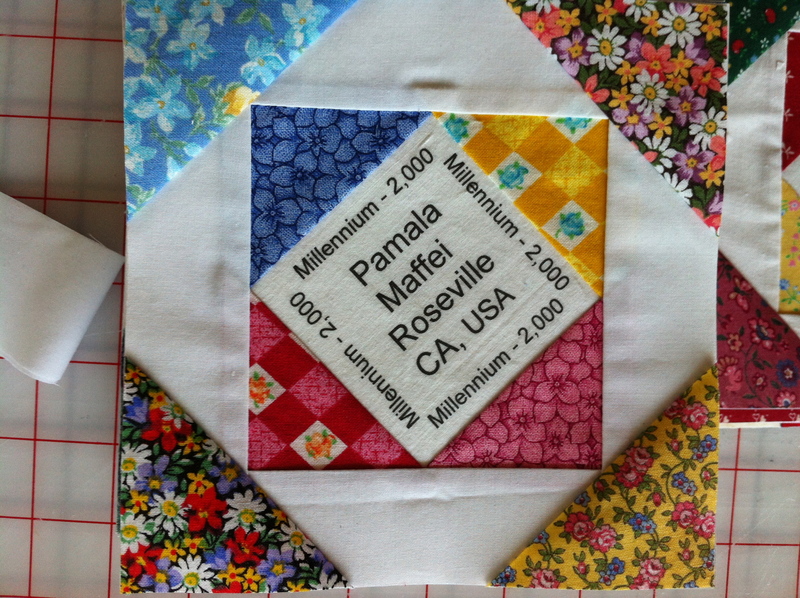 I thought I would show you the block I settled on for my squares and how I put them together using a technique called Paper Foundation Piecing. 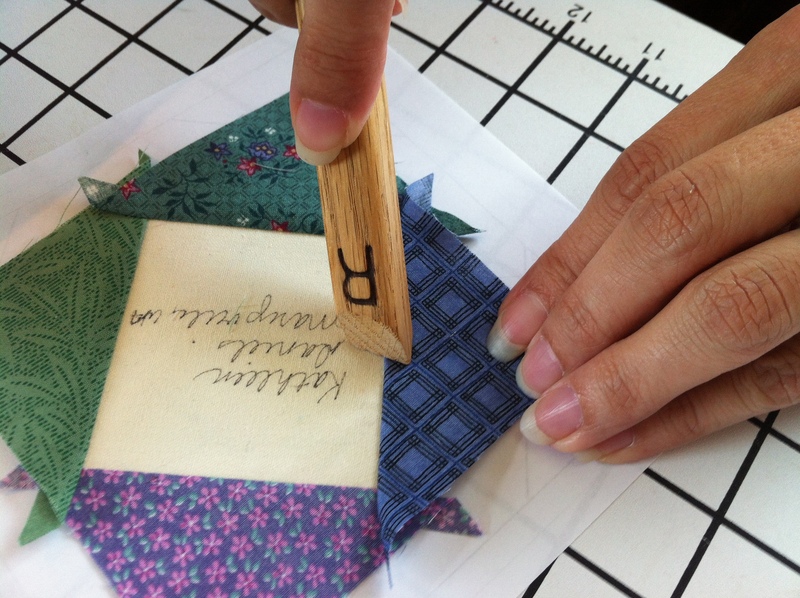 This is not to be confused with English Paper Piecing, an entirely different technique. 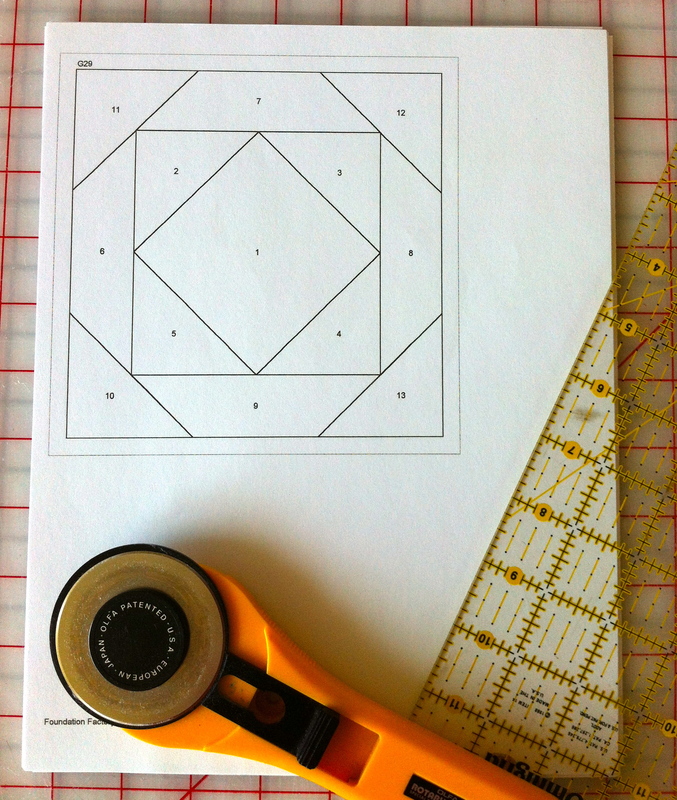 So, if you want to have some fun and piece a few quilt blocks without worrying about perfect 1/4″ seams and bias or grain being straight, follow the tutorial below and enjoy. To begin you have to print your block on paper. I used a fairly simple block, with a finished block size of 6″. The block I used came from a computer program and I printed the original over 13 years ago, so forgive me if I don’t have the name of it. You can find many awesome block patterns on the internet and one site I really like is Paper Panache. Print as many copies as you will need blocks. 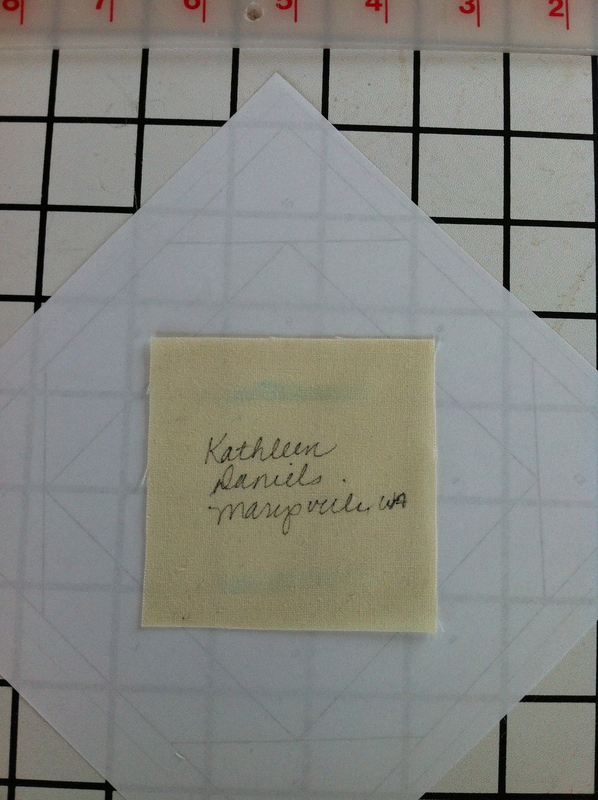 Here is what the signature blocks look like in the center of the square. 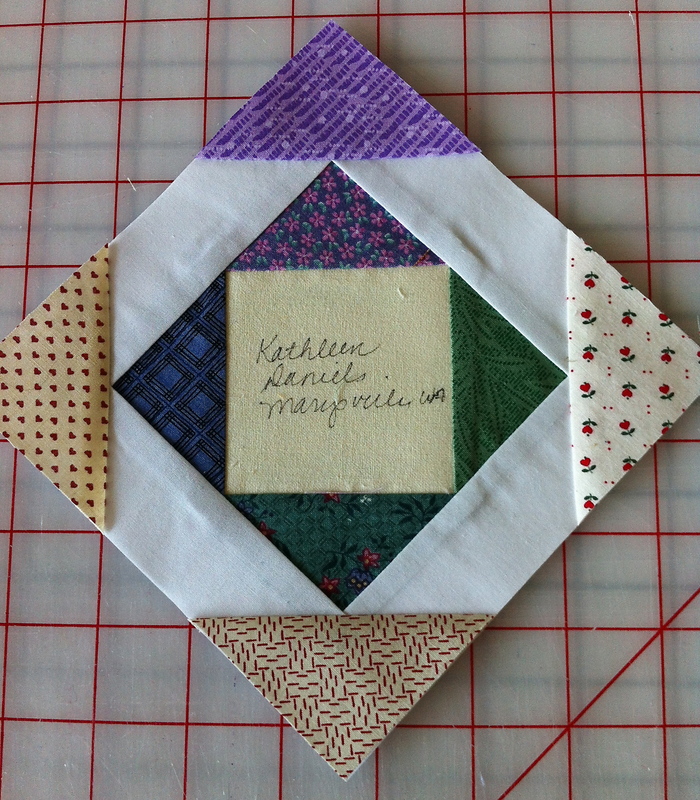 For each block, I used the signature square and 8 fabric squares from the packet each quilter sent to me. Sometimes it was hard to make a good combination and sometimes all the fabric squares in a packet had an obvious theme or colorway association. 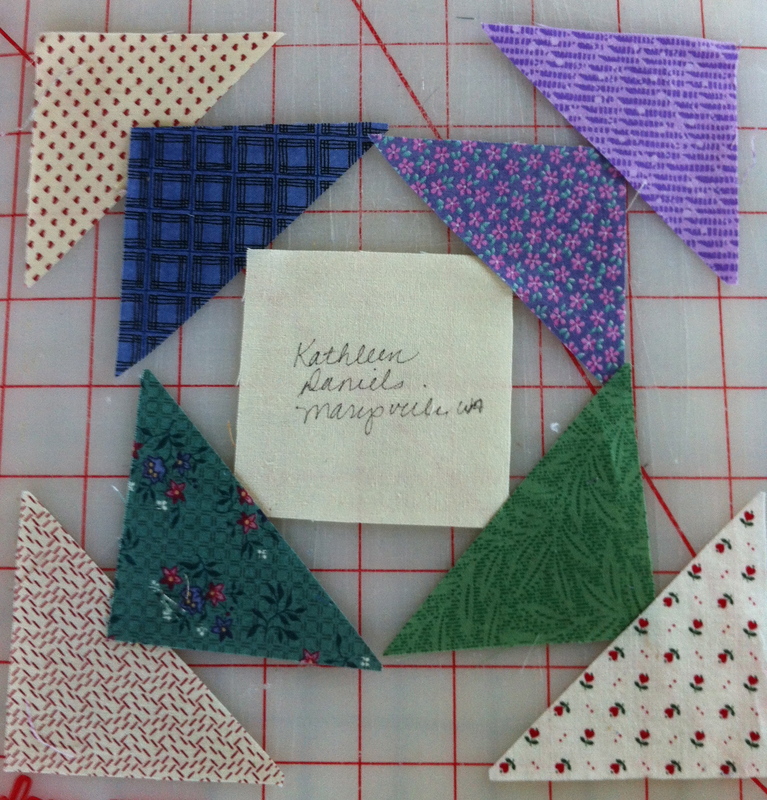 I took the 8 fabric squares and cut them in half, discarding one half for use in another quilt later, and arranged the remaining triangles on my mat the way they were to be placed in the block. Once I had them arranged the way I wanted, I took the paper pattern, turned it upside down, and, using fabric glue, adhered the signature square to the center of the block on the section #1 (see paper block above). After this, I placed the first triangle (I always started with the one in the right corner section) right sides together with the signature square, having the edges somewhat even, see below. 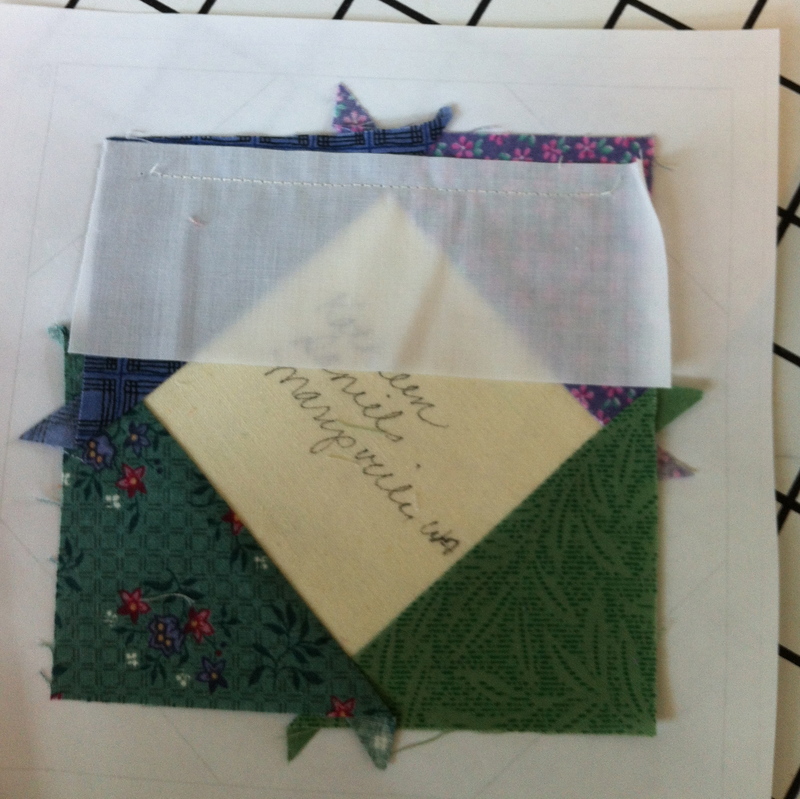 Holding all the pieces in place, flip the block over and stitch on the line between section #’s 1 and 2. 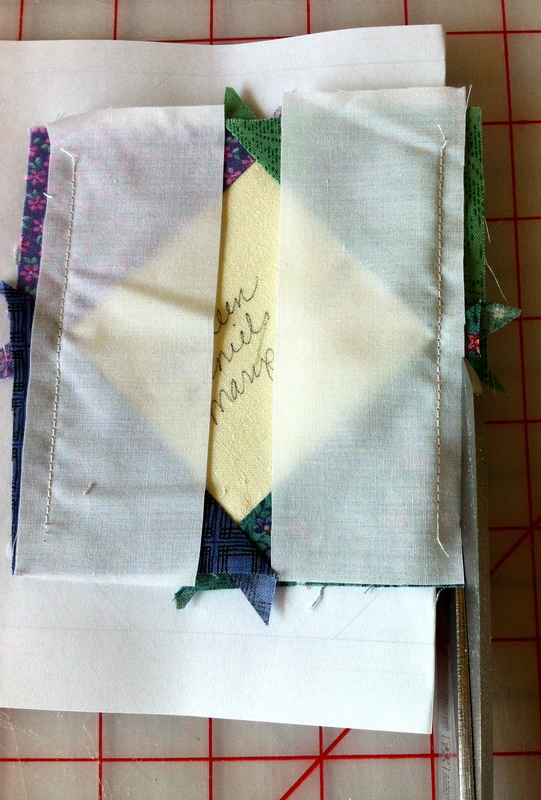 Then, flip the block back over, lay back piece #2 and press. Follow this procedure through piece 13. When I work with tiny pieces, I like to keep this wooden “iron” by my machine (see below). It keeps me from having to get up and go to the actual iron quite as much. You just rub the tool on the seam and it presses, actually creases, the piece in place quite nicely. 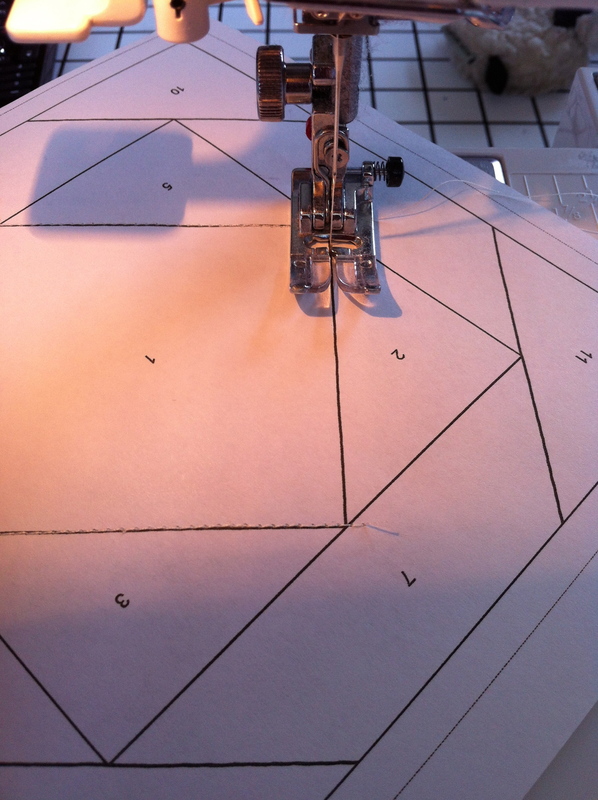 Generally, when doing paper foundation piecing, it is important to follow the numbers in order. Getting out of order usually causes huge problems. On this block, however, you can do some things to speed up the process. After pieces 1-5 have been sewn down, I opted to do pieces 6 and 8, then 7 and 9. This way I could press the opposite pieces back at the same time, saving time. 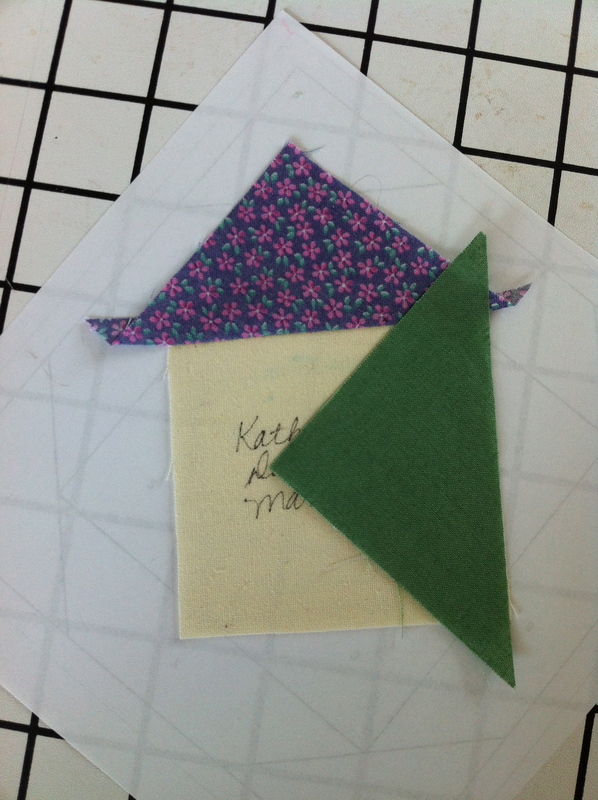 I sewed down pieces 6 and 8, then trimmed away the excess, folded back the pieces and pressed. Always remember to trim away all the excess before pressing the pieces back. 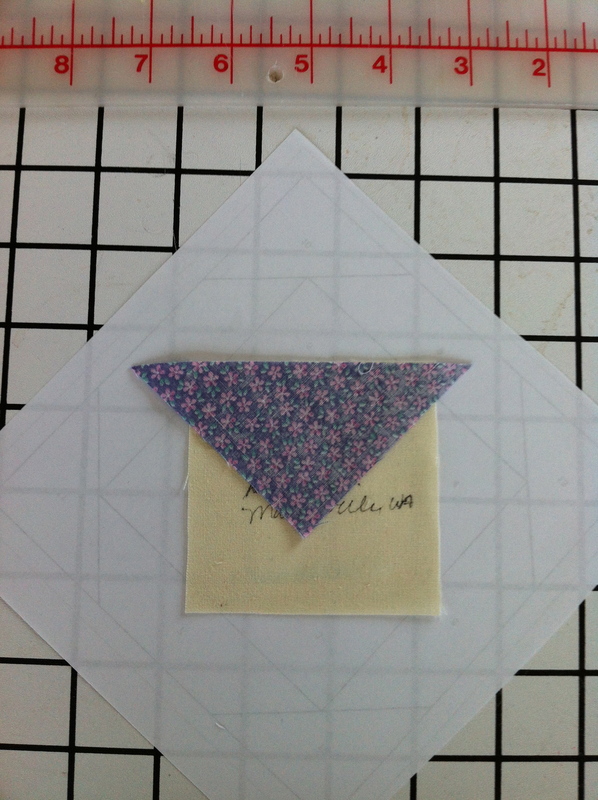 The great thing about this technique is that you can lay any shape piece down on the paper, sew on the line on the back, flip it over, fold back the paper out of the way along the seam line, and trim off the excess fabric. 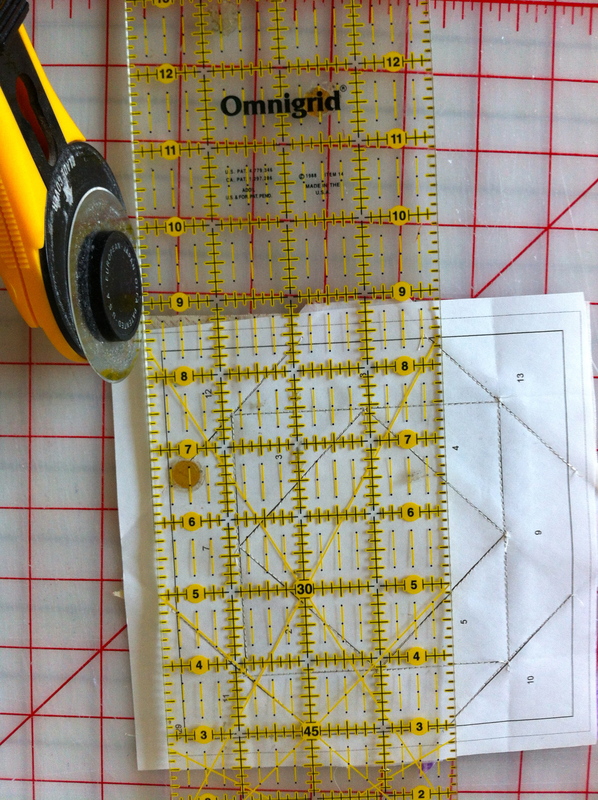 No worries about keeping a straight 1/4″ seam or whether the bias is going this way or that. 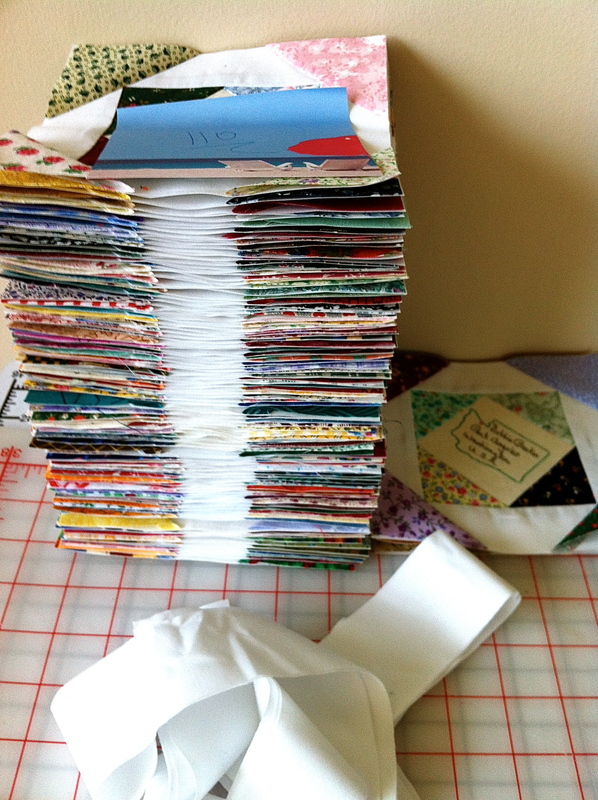 I used white fabric scraps I had in my stash for the “background” pieces. Below is what the block looks like after all the lines have been sewn. Once all the pieces have been sewn down to the paper, flip the block upside down and trim off the excess, making sure to cut on the outer line, not the inner one. The inner line around the border of the block is the sewing line you use to sew the blocks together, or the seam allowance. Here is how I intend to put the blocks together. I could use a sashing between the blocks, but I really like the way they look when put together without. 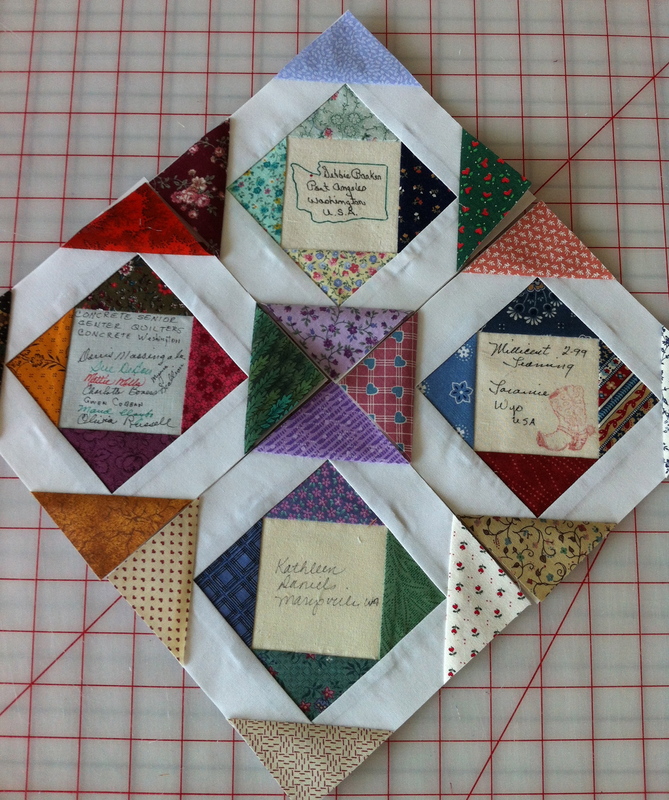 Foundation Paper Piecing is very fast and you can make some very complex block designs with this technique that you could not really do with traditional methods. I hope this tutorial makes sense and I hope you stick around for what comes next. Cheers! Love the signature exchange idea. Great tutorial.